The Central Coast Area NA Hospitals and Institutions is a part of the Public Relations committee. The purpose of the Hospitals & Institution committee is found in our fifth tradition: "Each group has but one primary purpose—to carry the message to the addict who still suffers." Or attend the next Public Relation Committee Meeting! ​​When: 4th Sunday/month at 4 p.m. Copyright © 1985, 1996 by Narcotics Anonymous World Services, Inc. Many Narcotics Anonymous members have found Hospitals and Institutions service to be an important part of their personal recovery. Our members, who actively participate in H&I service, are very important resources in our fellowship. A commitment to H&I service is one of the many ways to become involved with the NA service structure and help us feel a part of our fellowship. We know that active addiction leads to jails, institutions, and death. Also, NA’s primary purpose is to carry the message of recovery to the addict who still suffers. It is not surprising that carrying the NA message of recovery into hospitals and institutions is one of our priorities. NA members have consistently supported this belief by forming Hospitals and Institutions (H&I) committees around the world. Still, some NA members have been reluctant to become involved in H&I service because they have never been incarcerated, arrested, or institutionalized. With our personal experience and proper preparation, all of us are uniquely qualified to carry our message of recovery. This pamphlet is intended to be a brief introduction to Narcotics Anonymous H&I service, and to encourage more members to avail themselves of this opportunity to serve. The purpose of an H&I meeting is to carry the message of recovery to addicts who do not have full access to regular Narcotics Anonymous meetings. H&I meetings, except for those in long-term facilities, are intended to introduce those addicts in attendance to the basics of the NA program. In order to form a clear understanding of an H&I meeting, it is important to learn about our service structure. An H&I meeting is generally a service provided by an area service committee’s H&I subcommittee. The Central Coast Area NA Hospitals and Institutions is a part of the Public Relations committee. These meetings occur in hospitals, treatment centers, correctional facilities, and adolescent institutions. Rather than being an NA group, it is vital that an H&I meeting always be held under the direction of an H&I subcommittee. An area H&I subcommittee is the center for planning and organization. This is the ideal place to start getting involved! The first thing to do is to show up at an area H&I subcommittee meeting and attend an orientation for new and interested members. The Central Coast Area NA Hospitals and Institutions is a part of the Public Relations committee. These orientation meetings help members become familiar with the information and clean time requirements necessary for service in H&I. At these meetings, members are selected to carry our message into facilities. Usually, the next step is to attend an H&I meeting as an observer. Through this process members gain a basic understanding of H&I service and decide on a level of involvement. Why Do I Get Involved? Hospitals and institutions service offers addicts an opportunity to demonstrate gratitude, fulfill responsibility, and share the NA message without expectations. It is also an effective tool that helps us stay clean, and keeps us coming back. 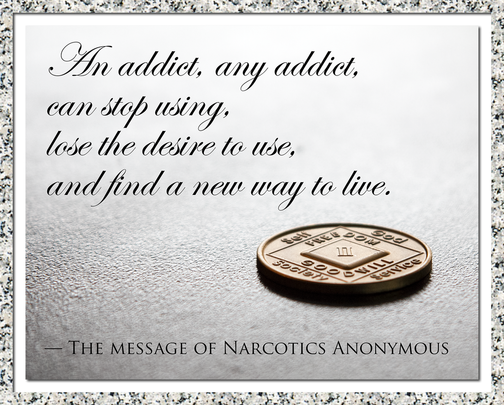 The H&I message is the same as the NA message: “That an addict, any addict, can stop using drugs, lose the desire to use, and find a new way to live.” The gift we share is hope and freedom from active addiction through the program of Narcotics Anonymous. Any NA member who wants to carry this message is encouraged to get involved with H&I service. There are many ways to serve in Narcotics Anonymous, and many of us have found H&I service to be the most rewarding aspect of our recovery. We hope that this pamphlet will encourage you to get involved with H&I service and experience these rewards for yourself!